The last remains of the old phone pole have been hauled away. 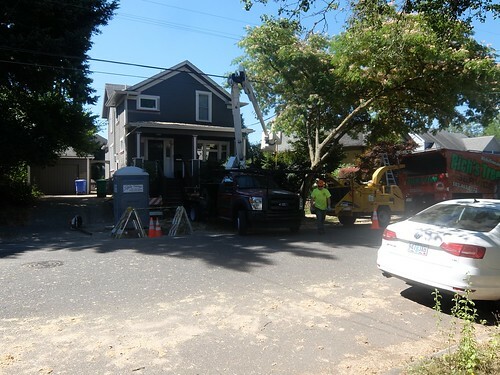 Today, starting 8 AM, the job is to completely remove a large street-side tree another house down. The city approves, but I'm not sure if they're paying for it. My impression is it interferes with the sewer line, so maybe so. I think I've been fairly successful on math-teach, making my case that the K-12 math curriculum needs to adapt. On the ground what that looks like is an infusion of CS (computer science) as a separate discipline, so that math texts might continue as they were. The Learning to Code movement has been effective. My campaign to make more room for tetra-volumes at least in sidebar, as a teaser, is a decades-long endeavor which has an unclear outcome, so the powers that be seem as yet unwilling to invest. Too many unknowns? We have to recognize the standard pattern: early adopters, bandwagon, laggards (one may use other terms). I focus on "international schools" (such as I attended) as where this history and literature is more likely to make inroads. The nationalism versus globalism debate is less a debate than a continuation of East meets West. People still think in terms of "western civilization" and historically speaking that's useful. However, going forward, I don't think so. I argued on QuakerQuaker about this, suggesting "western civilization" is an obsolete term in many contemporary contexts. Giving the Russians such an important role in determining the political landscape of what used to be considered "US domestic politics", even writing it into law, is something of a breakthrough. The superpowers are merging, in terms of synergizing oligarchies. That's not what the nationalists have in mind, but precession was never about straight lining from A to B. What are the chances? A phone and electrical pole utility truck pulls up across the street and starts transferring what remains attached to pole A, the old one, to pole B, the new one. We have some tree branches and stuff, touching the wires. Couldn't the guy have just shaken it loose then? My CenturyLink optical fiber connection stopped working. My wire goes right to that space. I went out and talked with the crew, but they said no, they'd not done anything to mess with my connection, call CenturyLink. Which I did. A technician should be coming in the morning. That's good, as I have another class to teach on-line come evening. But if it's not a ladder truck, just a van, a repair may be out of reach. 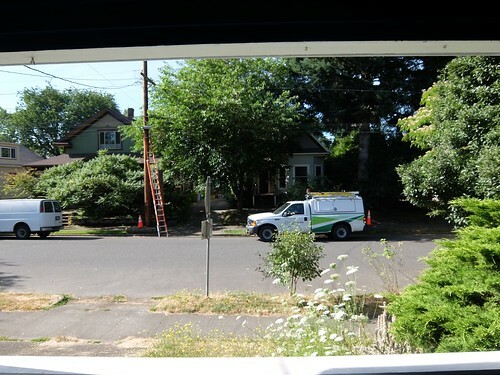 The CenturyLink trouble shooter on the phone didn't think it was the a pole problem either. I think it's a mistake, by the way, to make "cyberspace" be just the Internet. The telecommunications revolution started with radio (before that telegraph), and then television. I get my Prism TV through the Internet, even though I don't watch it, stick to broadcast. I have a digital antenna. The Internet wraps all that up, and then some, along with the telephone, also revolutionary. That's all cyberspace. Segregating the Internet from voice, phone, radio and TV, saying cyberspace is only the former, not the latter, is really dull-witted. Like I say on math-teach, it appears that English is broken, and those who think in it have a hard time having coherent thoughts. I'm using my Verizon phone as a hotspot at the moment, which explains how I'm able to blog sans my expensive / fancy optical fiber connection. Followup: the CenturyLink tech confirmed my suspicion: they'd touched the wire. Photons don't like sharp corners; there's a reason for those hoops. Think of a garden hose with a cinch in it (a pinch); the water stops flowing. He unpinched it, by climbing a ladder, and service was restored. I've been busy with summer camp lately. That conjures images of the great outdoors, hiking and pitching tents, campfires. Not in this case. The kids and I were in a back room in a tiny strip mall, struggling for bandwidth, learning to use MIT Scratch. In a next iteration, I took over for the Center Manager and had all three rooms to myself (counting the foyer) so we spread out. I pressed both HDTVs into service. 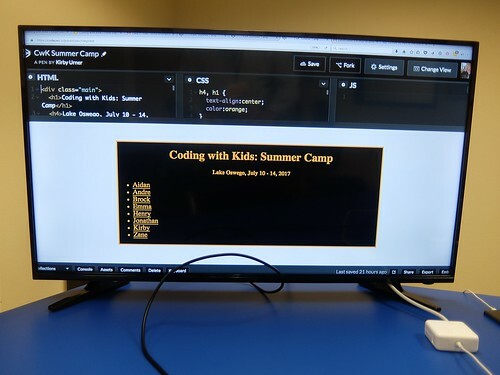 This camp was about Web Development; we used Codepen.io as our workout service. 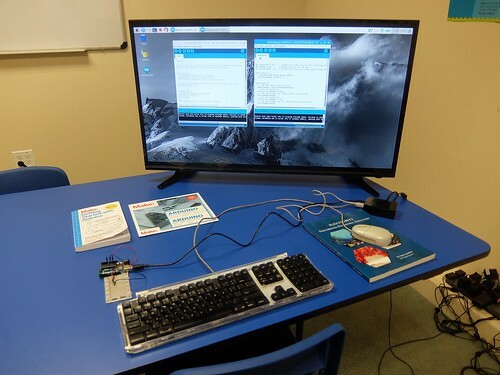 However I had an Arduino set up on the side, as a kind of "coming attraction". Speaking of coming attractions, the new Planet of the Apes movie has opened at the Bagdad. I've been following that franchise since the beginning, with Charlton Heston and Roddy McDowell. Here in 2017, the flavor has changed quite a bit, but I've continued to enjoy the science fiction. I think of how Bucky Fuller claimed we were devolving into a Planet of the Apes thanks to overspecialization. Throughout these weeks of summer camp, I've been holding up my end of the debate on math-teach. I'm also posting to QuakerQuaker (Q2) but I'm less confidant that archive will withstand the test of time, given the site owners have talked about dumping the existing framework for something else, losing all our writings in the process. David Koski has branched out into spherical trig lately, looking at the 120 and 48 LCD triangles in Synergetics. I've been endeavoring to follow from a distance. Lastly, I'm keeping up with my one Coursera course, Interfacing with the Arduino, that I'm taking for credit. I'm in the process of auditing a few others, mainly to bolster my HTML + CSS + JS skills. I was unaware until yesterday, for example, that the CSS grid feature has become available, since earlier this year. That's going to come in handy and feature in future versions of Web Development, either as a camp or after school. Glenn was by this morning to report success on what seemed to some of us a long shot: getting Don's boat back in the water in time for this year's Blues Fest. 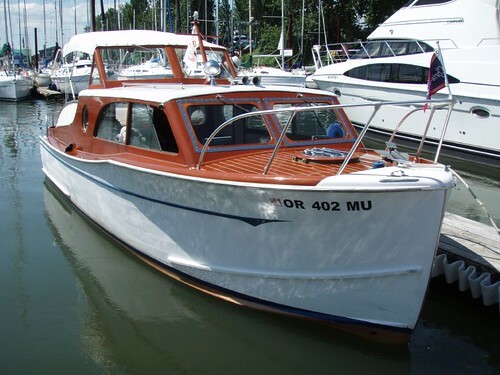 For those just joining us, Don's boat goes way back in these blogs. Without going into too much detail, Don having his boat there is a tradition, but with so much use over the years, way more than average, this 1927 Chris-Craft was overdue for deep maintenance, as in rebuilding the hull. Barry and Don have been on it for months, Barry having completed a first prototype of his enclosed two wheeler (motorcycle with full body fuselage with ways to stabilize at rest). Glenn pitched in four twelve hour days in the final push. I tweeted Chance, the lonesome cowboy we met north of Redmond. We bought him some biscuits and gravy at a roadside place in the sun. @Artpotheosis. Judy is taking care of estate matters. The family has once more dispersed with respect to the physical plane (more a sphere by today's reckoning).